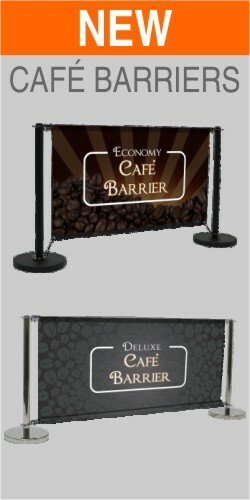 A new class of Café Barrier is now available to all our customers. Black (Economy) or chrome (Deluxe) units. Includes graphic printed on 210gsm Display Polyester for superior quality and finish over typical PVC graphics. 1500mm and 2000mm (Deluxe only) widths. • Single-sided or double-sided graphics. As of the 25th May 2018, all businesses are required to comply with the new regulations on GDPR (General Data Protection Regulations). The new regulations mean customers will need to give their permission if they would like to receive emails, text and telemarketing from businesses that hold their information. We would like to take this opportunity to reassure our customers that we take date protection very seriously and under no circumstances forward information onto third parties unless required by law. Emails: We use emails to contact our customers when we are offering special promotions on items which we think may be of interest. customers and placing them on social media sites such as Facebook and Instagram. We always ask permission first and our customers are always grateful for the free advertising.